Celtic knots woven throughout. All of this is masterfully weaved together in a traditional Celtic knot-work. You choose how many stones to add and of what color. You can hooking it closed into any link making it very flexible for size. Add more charms to this keepsake as time goes on. Pass it down to your generations. 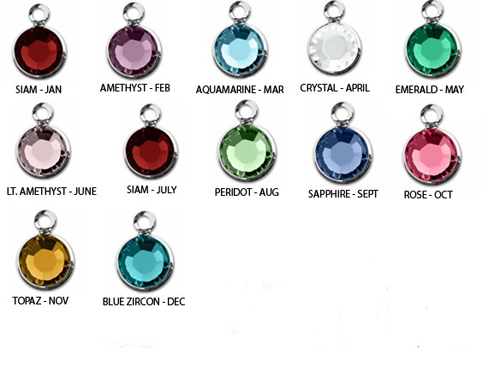 Birthstones are genuine Swarovski crystals. We are making this beautiful line in the USA . Sterling silver and rhodium ( tarnish protection) are over this stunning lead free pewter set. -Birthstones are genuine Swarovski crystals. 1.. Select the qty for each birth-month and add to cart below.